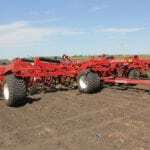 Morris has replaced its C2 Contour air drill with the new Quantum, which debuted at farm shows this summer. 650x22.5 tires will give the frame better floatation. 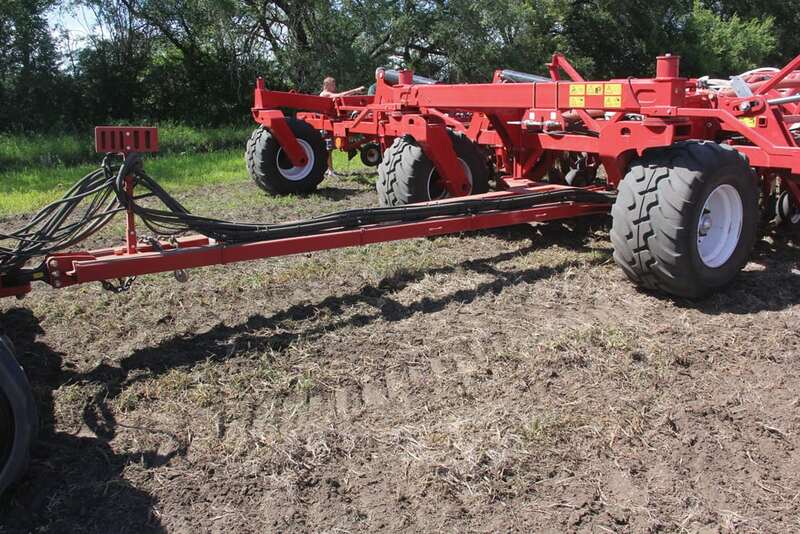 The Quantum frame using the same parallel linkage shank system was also introduced to farmers at the Ag in Motion farm show as a tillage implement. 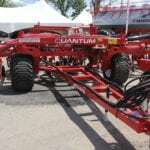 The Quantum drill gets a stronger hitch that uses 20 per cent more steel. 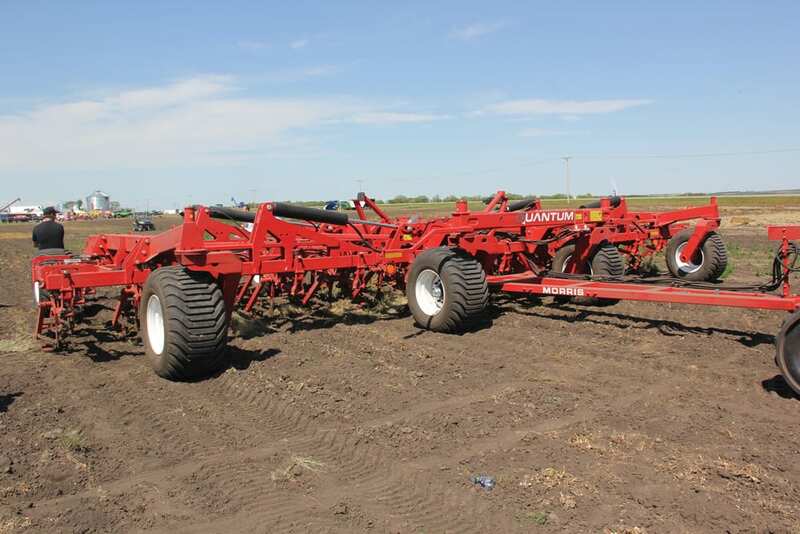 At the 2018 edition of the Ag in Motion farm show at Langham, Saskatchewan, Morris Industries had a new drill to take centre stage at its display, the Quantum. 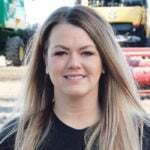 Although the Quantum drill put in an earlier public appearance in Regina in June at Canada’s Farm Progress Show, the brand picked the Ag in Motion show for the official launch and first public in-field demonstration. 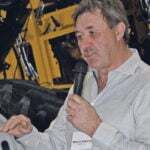 As an agronomist, Massie says he is most excited about the improved agronomic performance the brand expects the Quantum to deliver. Although the Quantum will continue to use Morris’ flat pan distribution head, the version on this drill has seen significant changes. “We’ve never used a tower,” he continues. “Any time you make any sharp turns or vertical rises, you lose capacity to deliver higher rates, that’s why Morris always has the flat pan head dividers. This is a new and improved version. A step forward, so we’re pretty excited about that. 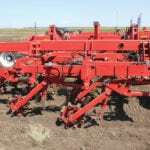 The Quantum will also offer the capability to seed deeper, with quarter-inch depth interval settings that are quickly adjustable. 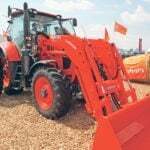 Massie says engineers also paid attention to that traditional farmer demand for durability and longevity in equipment. “The row unit itself is new,” Massie adds. “Some of the things that stand out about it are we’re now using one-inch chrome pins across the board and there’s a bigger surface area on the bushings. We’ve changed the design of the packer arm. It’s going to be stronger. The Quantum drill frame will ride on much larger rims than its predecessor. 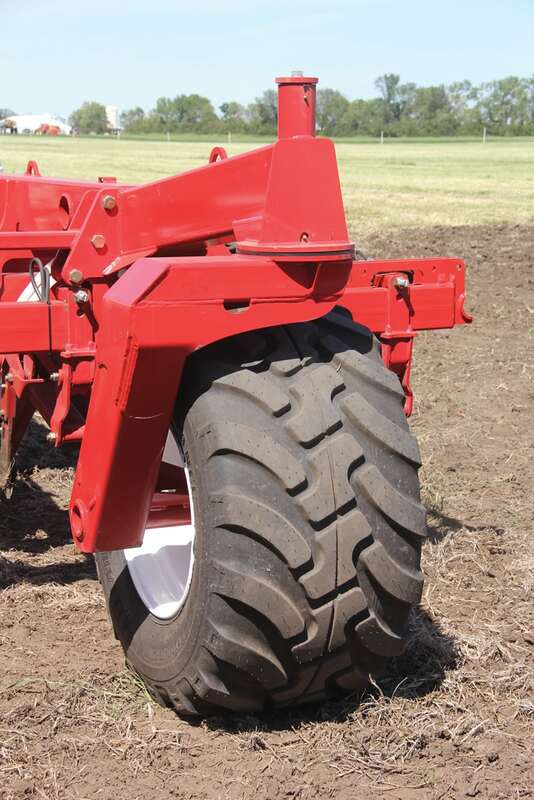 650×22.5 rubber will give it improved floatation. “They’re 19 per cent taller than the 16.5Ls we had before,” he says. There will be an active hydraulic system as well, which will enable farmers to use an auto lift system on headlands and an auto pack system. 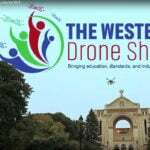 All that will be controlled through a Topcon X35 monitor. 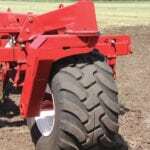 Its design will also be compatible with controlled traffic farming operations, with tires set on three-metre spacing. 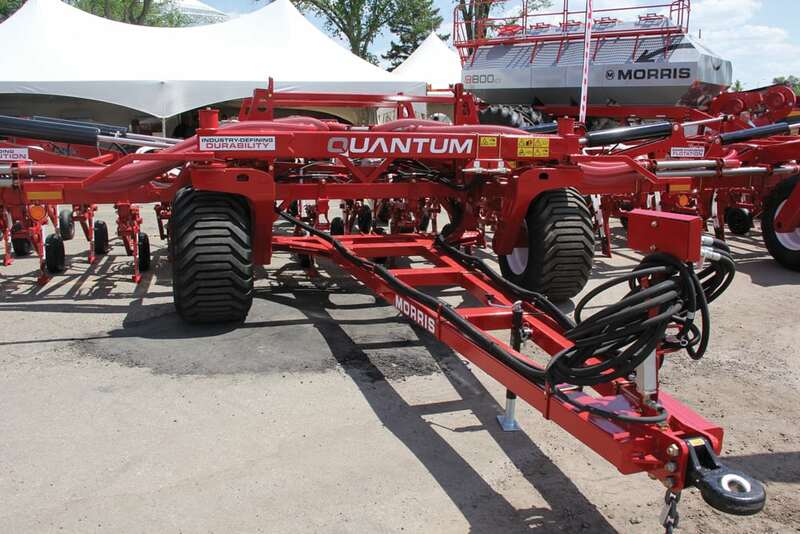 This year, the Quantum will be available in 40-, 50-, 60- and 70-foot working widths. But there was one other thing the brand was able to manage with the Quantum. 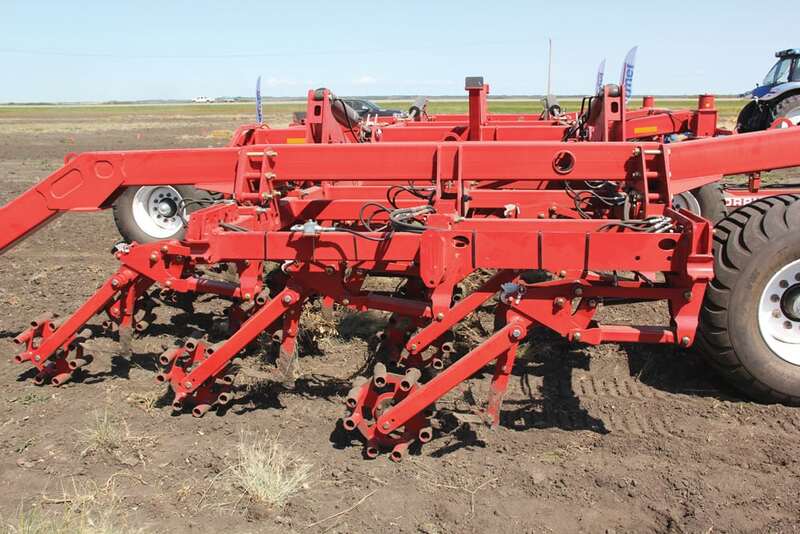 It has also released a tillage implement version using the same Quantum parallel link shank system. 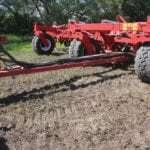 The Quantum tillage tool took part in the tillage demonstration along with its competitors at the AIM show in July.